Could it change to be a source, instead of a sink, of CO2 in the next future under global warming impact (Le Quéré et al., 2007)? Is it an appropriate area to be used for bioengineering purposes by means of oceanic iron fertilization (Smetacek and Naqvi, 2008)? The Pump Eddy oceanographic campaign is an effort headed by the Alfred Wegener Institute (AWI) on board the Polarstern (chief scientists: Ulrich Bathmann y Volker Strass) with the aim of generating multidisciplinary information not able till this moment in these area of the ocean. In particular, about the eddies dynamics, carbon fluxes in different areas of the Austral Ocean during the phytoplankton blooms and the previously asked questions. To this end, a multidisciplinary study will be carried out by 45 researchers during the austral winter (January-March 2012) in the area between the Antarctic divergence and the subantarctic front, where water masses are upwelled, interacting with the atmosphere before being submerged again (Figure 1). 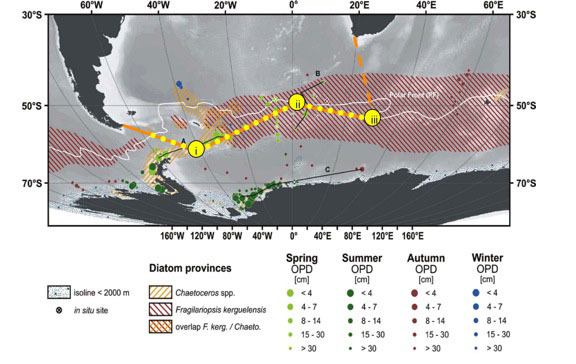 The working plan envisages the repeated sampling of eddies (cyclonic and anticyclonic) placed in the Antarctic Circulation Current (ACC) but with different biogeochemical conditions. 1) Set up a system for the determination of total iron concentration on board by means of the FIA (Flow Injection Analysis) technique with column preconcentration and chemiluminescence detection. These determinations will be carried out in water column samples at different depths using clean techniques and procedures during sampling and analysis. The speciation, both organic and inorganic, gives an idea about iron biodisponibility. 3) Use iron concentrations and speciation to characterize the origin and iron vertical fluxes in the different sampling areas, chosen as function of the biologic conditions and properties: Chaetoceros area (high and lasting chlorophyll concentrations), ACC area (ocasional phytoplankton blooms) and the high kinetic energy of eddies (controlled by high Flagilariopsis kerguelensis populations). Dissolved and particulate iron concentrations will be studied together with the biologic parameters, incubations and advective fluxes in order to try to explain the predominance of the different phytoplankton species at each area. 4) Several variables determine the low phytoplankton concentrations in the Austral Ocean; among them, iron biodisponibility, light limitation and zooplanktonic control (Boyd et al., 2000; Coale et al., 2004). The experiment has been planned in order that these three variables could be considered at different areas of the Austral Ocean. 5) Measure the evolution of iron concentration and speciation in incubations on board with the collaboration of Dra. Scarlett Trimborn (AWI) y Dra. Christel Hassler (University of Technology Sidney, Australia). The objective is to add iron in different organic forms and monitorize the cellular growth and changes in CO2 concentrations to study iron limitation and the effect of the different iron forms and CO2 concentrations over the primary production. Trace metals play an important role in the oceans as micronutrients, as tracers of processes now and in the past, and as contaminants. Their biogeochemical cycling has direct implications for research in such diverse areas as the carbon cycle, climate change, ocean ecosystems and environmental contamination. Iron is known to be an essential micronutrient, and their low concentration in the oceans often limit several processes such as photosynthesis or carbon fixation in areas where other nutrients are present in excess. In addition, cobalt starts to be considered as a limitant factor in some oceanic regions due to its low concentrations. Many other trace elements play a role in the cellular physiology and biochemical reactions; therefore their input is going to take control over the structure and probably the productivity of marine ecosystems. The understanding of the biogeochemical cycle of these micronutrients needs from the knowledge of their several sinks and sources, as well as their transport, chemical form in the ocean and interactions with the organic matter. To this end, the Rias Baixas area and the adjacent continental shelf have been chosen as environmental laboratory where an extensive study will be carried out in order to solve the doubts and increase the knowledge about the biogeochemical cycle and behavior of these elements (Fe and Co) in the transition area River-Ría(Estuary)-Ocean. Figure 2. Dissolved iron behaviour during the estuarine mixing in the Vigo Ría waters (a) and in other worldwide estuaries (b). The first studies about iron concentrations in the Vigo Ria (López-Benito, 1969) showed a decrease tendency from the main river discharge (Río Oitabén) towards the marine endmember. At that time, and due to the ignorance about the possibility of contaminate samples with iron during the sampling process and analysis, clean techniques were not employed and iron concentrations seem to be quite low (125-1250 nM) from the present perspective. More recently, and with the use of clean techniques and clean labs, two studies about iron speciation in the Vigo Ria have been carried out. The first one was held in 1997 by Belzunce and collaborators and the second one in 2006 by Prego and collaborators. Both studies showed that dissolved iron levels oscillated between 150 nM in the riverine endmember and 15 nM in the marine endmember with cuasi-conservative behaviour during the estuarine mixing (Figure 2a). This fact is of importance relevance because this is not the usual iron behavior in estuaries where its dissolved concentrations decrease exponentialy towards more saline waters (Fox, 1984; Buck et al., 2007; Riso et al., 2007)(Figure 2b) due to iron precipitation with colloids or interaction with organic matter flocculates (Sholkovitz, 1978). Thus, our main objective is to find the reason of the different iron behavior during the estuarine mixing of these waters. Probably, the presence of any type of organic matter that allows iron to maintain in solution avoiding precipitation could be the reason.